Here are the last of the 10 cards I made with just 1/2 of one Simply Scrappin' Kit! 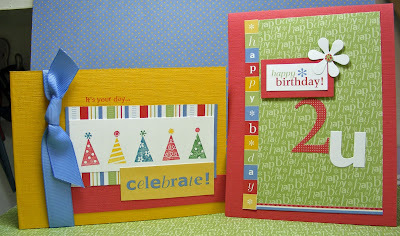 These kits often coordinate with Stampin' Up! stamp sets. I thought the Party Hearty set was a great fit for this kit. 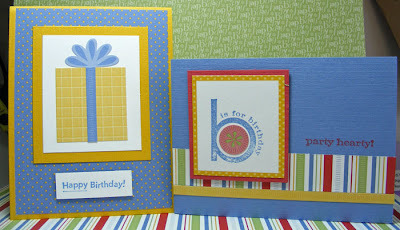 I used the large "b" stamp below and the party hats colored with markers above. The ribbon is Brocade Blue 5/8" grosgrain available in the current catalog.